Macrodox and you: Linus, the ban and unban. Last week, Linus was banned automatically by Macrodox for having a ‘perf rate’ of 90%+. The community was shocked and the global team scrambled to figure out what we should do. After a few days, we determined that the likelihood that Linus was cheating was very low, and that a bug was the likely culprit. With the help of the community, the bug was discovered and documented (Thank you Sach, Haru, Carrier, Squared, Potts, GameChaos, Kohze, Zpamm). This post is the explanation of that bug, and how we believe Linus ended up getting 90%+ perf rate. Macrodox is a plugin that has been around since 1.6 that is designed to catch obvious cheaters. It does this using two methods: analyzing jump counts (scroll patterns) and tracking a player’s bhop success rate. The jump counts are established by counting the number of times a player issues a jump command and releases that jump command between when macrodox updates its calculations. If you tap space bar every time you land, your jump counts will be all 1s. A normal scroll number is around 5-12, although this can vary greatly between players. There are 30 total jump counts saved by macrodox, although only 26 are shown using !bhopcheck. Macrodox updates its calculations of jump counts and bhop success rates every time a player starts a jump and is on the ground. That means that the jump counts are not incremented until this calculation happens. This condition turns out to be the cause of the bug that may have caused linus’ ban. 2: Player jumps in the air using the bind or spacebar, but too early, missing the perf. This jump increments the jump counter silently. -Because the player is on the ground and the player started jumping, the macrodox calculation is triggered! -The jump count is set to the total number of jumps that have occurred since the last calculation, in this case N or 4. -The bhop success rate goes up using the formula. As long as a player follows these events, their perf rate would only go up, and their jump counts would show the number of attempts the player made to try to get a perf. If we assume that the described method was used, then we can see that the numbers above 1 are actually the number of attempts it took for linus to hit a perf using only the space bar, or the number of attempts before he hit space bar after he landed, thus triggering a macrodox calculation and decreasing his bhop success rate. Not all of the jumps in this scroll pattern have to have used the bug, but in order to reach 90%+ there would have to be around 15 perfs in a row. This WJ method only works with the bind or with jump bound to space bar, because if a player scrolls when they hit the ground, they’re very likely to jump after they’ve landed, this triggering the macrodox calculation. Well, not really. 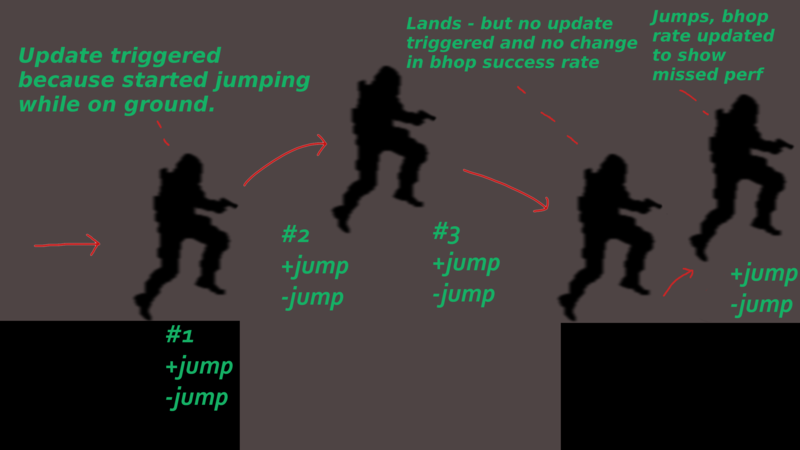 In order for this bug to continue to raise a player’s bhop success rate, that player must only jump before hitting the ground, not after. 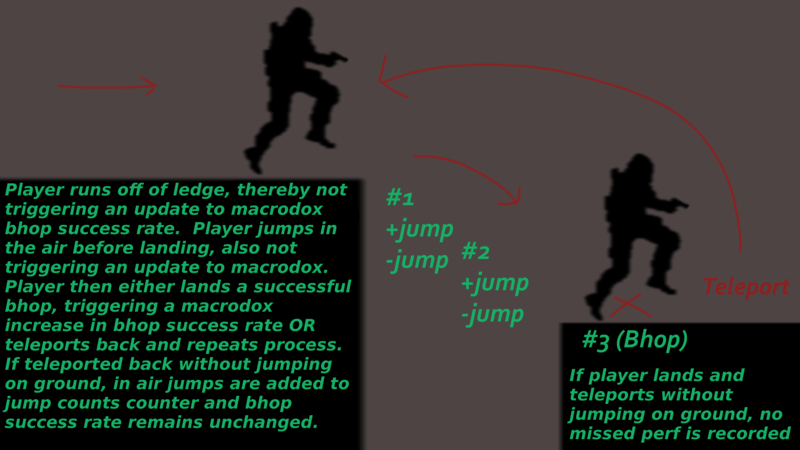 If the player hits the jump after they have landed, the macrodox calculation is triggered and the player’s perf rate decreases. This is difficult to do, but we don’t have a lot of data to show how difficult this really is. Many of the players who think Linus did cheat point to the fact that jumping only before you land is very difficult, and doing it consistently may be roughly as hard as timing the jump on the perf itself. However, we have had several players try this bug and come very close to 90%. We have created a non-global test server for you to try this WJ technique and try to get autobanned for 90%+ bhop success rate. Please join the server by typing “connect kztimerglobal.com” into the console and giving it a try. We look forward to your feedback and are happy to answer any question you might have on macrodox. P.S. While I’ve called this a bug, it is only a bug in so far as it leads to these three edge cases. The code is working as written. Thanks @PlastiS for a great edit, I specifically like the colour correction with the lava during the run. Got this clean run on one of the older records and oldest maps in csgo. Also received 0 demo submissions this week so legit no choice! Most runs this week were from the wiped maps, next week is already looking stronger in terms of optimized runs. Let me know if there are any issues with the release. Easiest way to get a hold of me is through steam or discord. @mistersisterfister back at it again with another ROTW, this time on a very unconventional map. He recently got some new tech to get a clean fast run, utilizing boosters and skilled surfs to beat the old route by almost 2 minutes. This kind of opens up a discussion of what the "run of the week" actually is.... I think it's the most interesting run to watch from the past week. It can be due to sheer speed, skill, optimization or in this case new route discovery. There is no way people weren't wondering how sub 40 seconds was possible on this map. In honour of bind being banned we will go with MOAR CLICKS! (also didnt get any of the demos from linus/bouta this week, this is actually a bot but a damn fine one if you ask me). In all seriousness it's a pretty damn clean run, so good job ClickBit (@Orbit )! Within this update we have implemented a bind fix, to make in-game lj bind nullified during runs. Meaning you no longer get the increased height while using the LJ alias of “+duck; +jump”. This bind is still available to use while map timer is not active to allow for jumpstatters to continue using it. The extra height is removed by nullifying tick perfect crouch jumps (CJ). To obtain a successful CJ (increased jump height by up to 2 units) there is a small window before jumping that a crouch can be done. Runners that currently do CJ no-ducks and crouch jumps greater than 64 units already use this timing window to perform successful CJs. False positives are entirely possible but are most likely to go unnoticed as you will still get the same height as if you crouched 1 tick after your jump command (standing 55 height). As a runner and a #fuckthebind enthusiast I honestly already performed my crouches purposefully before the jump command to make my CJ no-duck combos as consistently as possible. Just by principle hitting that timing window before jumping (it is several ticks) is more accurate and consistent than going for that exact same tick as jumping. @Cobrex is a veteran of the 1.6 kreedz community, XJ, in which he started an active role back in 2009. He became a prominent moviemaker & mapper, eventually creating his well known video "Kreedz The Movie" in 2013. But very recently he came over to CSGO kz to give it a shot and was particularly impressed with the aesthetics of some CSGO maps. For his first video @Cobrex chose to edit a run done on kz_moonlight due to the exceptional mapping from Jurkelis(@banananosis ), "for creating such a masterpiece". I hope to see him stick around for more great videos. You can find some of his previous work on youtube. The global rules can be seen here. Exploiting kztimer to improve times is a bannable offense but since this exploit was more recently found I have warned @GiimPyS ツ for the times obtained on conrun_mq and _scrub, these have now been deleted. In the future if you know about an exploited time or a glitched time from kztimer please report it on discord. Please note we are always trying to mitigate these issues through development or other means. So I have disabled globals on all effected maps by the exploit. If you know of any others that could be exploited let us know. @DanZay and @Sikari have found a fix for the TP exploit so in the best interest of maintaining integrity of top times I have decided to de-global these maps until KZtimer is updated. Reason I didn't want to before is because I didn't want to remove maps for an indefinite amount of time for something that didn't effect the more sought after record of Pro. Also @PlastiS has taken it upon himself to manage a kzclimb twitter account to give the youtube videos more exposure, give it a follow if that is something you'd enjoy.